My Blogger Buzz: How to Create Professional Blogger Template Using Artisteer? How to Create Professional Blogger Template Using Artisteer? Blogger Platform gain a lot more popularity these days. We see in present days really newbie blogger begin their beginning blogging journey with blogger platform. There million of users using blogger platform due to its user friendly features. But let me tell you guys on matter unfortunately even currently being blogger user a lot of them still do not know how to create a specialized blogger template. They are following pro blog writers or have minimal knowledge little at this point about changing your font style, putting gadget to blogger, and Css personalization. So if you might be truly like blogger platform and blogger lover then some time you might be get interested to design a professional blogger template. So this tutorial will lead us about making and build an innovative blogger template using Artisteer. So lets start the tutorial. Artisteer is really an great web designing software that help us to develop and design a creative blogger template without knowing CSS or even Html language. Is it doesn't first most well known online tools which in turn get compatibility together with all such favorite platform. like Blogger, Drupal, joomla along with Wordpress. Artisteer software may use to create distinct templates for distinct platform. Artisteer is as used by so many expert bloggers and website owner they create 1000s of template in seconds employing this software. one of the most effective and prominent characteristic of using Artisteer regarding template customization is that it is able to drag and lower the objects aspects. It is this automotive designing tools which work towards dragging and droping options. How to Create Blogger Template Using Artisteer? When you chose Blogger platform, You have to create many major functions of blogger blog. One of them is header. To add header, just click the header tab as below screenshot. It enables you to adjust width, height and positioning , background etc. which are enough to create a good header. How to Add Favicon to Blogger Blog? 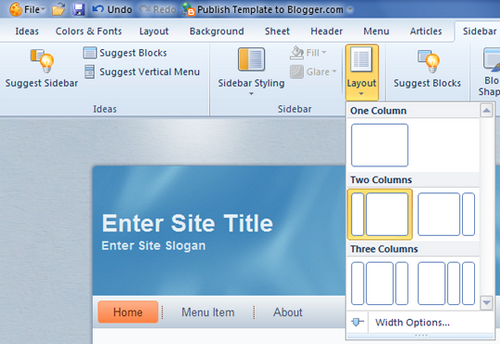 Now You added all major components of a blogger blog template. It's the time to stylize it. How to Create a Full Width Page and Remove Sidebar In Blogger? Congrats! Now You are ready to design your own unique blogger template. Now It's your turn to share this post with your friends and write your feedback in comments till then Peace, blessings and Happy Creating.